"...But �Lottery Day� does not disappear inside the playwright�s head. Holter is too social and generous a creature for that, and his performers have too big a collective personality to abdicate their characters� points of view, even for a second. They�re like a team always competing for the ball, ready to take down anyone daring to challenge their spot in the playoffs. And thus Brown and her terrific company reveal to us a city with troubles but an unshakeable force of personality, a town here trying to party away its own inequities, failing at that but maybe finding some sort of shared future � in what�s now a new day for the City of Chicago. The villains in Holter�s head are in retreat. Maybe." "..."Lottery Day" delivers a comic and dramatic win -- as well as a victory lap -- for prolific Chicago playwright Ike Holter. 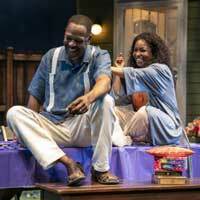 And audiences can enjoy the payout as well thanks to a raucous world-premiere production at Goodman Theatre." "...In Lottery Day, neighborhood matriarch Mallory, who lives in the last old house on a newly "revitalized" block, invites a handpicked list of her closest family and friends to her backyard for an evening of merriment and mystery. Played by an explosively charismatic J. Nicole Brooks, Mallory is unapologetically saturated in her own existence, full of glamorous joie de vivre, piss and vinegar, and a lot of weed." "...It isn't necessary to have seen the other plays, though. Many of the beautifully-written characters may have originated in other plays, but they are fully rounded in this one; Holter is careful to allow each of then to take the focus of the rowdy bash with its loud, overlapping dialogue, music and humor. Nothing here is cheap or unearned; this gifted young playwright has created a world and populated it with dynamic characters with lives of their own, and director Lili-Anne Brown makes sure that they and the party remain alive and vibrant throughout the play." "...Director Lili-Anne Brown excellent cast brilliantly represented the affliction that Holter wanted to portray in the ethnic arrogation of a gentrifying neighborhood, where friends are pitted against one another to find hidden treasure buried in Mallory's backyard." "...Neighborhoods change! This is a fact of life! Having spent over 60 years ( I won't say how many over) in Chicago, I have witnessed so many changes, I can't keep up with them. The question that arises in Ike Holter's newest play, "Lottery Day" is "Do changing neighborhoods, change people"? or "Do people change neighborhoods". Gentrification will continue to happen and Holter hits the nail on the spot with this, his concluding play of his seven-play series, "Rightylnd Saga". And what a story!" "...Holter has stated that he wants to raise Chicago�s profile in the theater world and beyond, to see his city as a complex character in the stories that take place within its wards. Time will tell if he gets his wish. He�s sure tried hard enough and that counts for something. Regardless of what the future holds, for those of us lucky enough to come along for the ride, it�s been a sincere pleasure and a hell of a good time. After many, many words written, there seems to be only one appropriate thing left to say: Thank you." "...It must be said that theatergoers need not have attended all, or any, of Ike Holter�s previous plays in order to fully understand and appreciate Lottery Day.� The play stands on its own and will make every audience member fall in love with this group of individuals who�ve come to par-tay with Mallory. It�s a celebration of life, seasoned with determination, fortitude, grit and guts. This is a production that both brings Holter�s work all together in one final chapter and inspires theatergoers to want to see his other plays. It�s simply one of those life-affirming sensations that will stay with you always." "...It is inevitable that Ike Holter's seven-play sequence will be compared with August Wilson's 10-play cycle about African American life during the 20th century. Holter still isn't at the Wilson level in depth or narrative command, at least on the evidence of the two plays I saw. But the language skills are there and so it's the ability to create vivid characters while attacking relevant themes that can engage both black and white audiences. Maybe some theater benefactor will bankroll a complete staging of the entire Rightlynd Saga with the "Lottery Day" ensemble as its core. If not, we still can look forward to Holter's next play with much anticipation." "...Lottery Day is a party with a guest list of nine. Mallory (a sizzling J. Nicole Brooks) has invited them to her back yard to celebrate, but no one knows what the occasion is. With a rich and complex web of characters, Ike Holter�s play at Goodman Theatre brings together the threads from the other plays in his seven-part Rightlynd Saga. Skillfully directed and choreographed by Lili-Anne Brown (with Breon Arzell as assistant director), Lottery Day reminds us that Rightlynd, Chicago�s fictional 51st ward, is all about what�s right and wrong with our city. Our mayor-elect and other members of our new city administration should head down to Dearborn Street now before their first council meeting." "...Directed by Lili-Anne Brown the entire cast is excellent. My problem was that I couldn�t catch a lot of the dialogue and I would have liked to have gotten to known the characters better." "...Last night, the final piece of the �Rightlynd Saga� opened at the Goodman Theatre. Lottery Day is both a farewell to this world and a very conscious crescendo. Where the six previous entries connected only at their edges, with fleeting mentions of plot points elsewhere in the shared universe acting like Easter eggs for die-hard collectors, Lottery Day actually brings together characters from each of the prior plays along with a few new faces to close out this story. It�s a carefully plotted crossover event: the Avengers: Endgame of the Holterverse." "...If you are wondering whether it is necessary to have seen any or all of the previous installments�which was the question that was bantered about in the high-energy buzz swirling in Goodman�s Owen Theatre on Monday night�the answer is no. Your enjoyment of Holter�s last day and night in Rightlynd will be enriched with those experiences, but do not let their absence dissuade you from putting �Lottery Day� where it belongs�at the top of your must-see list!" "...Expert craft, top-notch cast, and a thought-provoking script makes Lottery Day one that should not be missed. At its core, this is a play about Chicago. Whether you are new to Ike Holter�s work or one who has been anxiously waiting for the saga�s conclusion, there is something for everyone to appreciate and consider. This writer for one had no problem joining the standing ovation at this opening night performance." "...This is a play about heads, hands, hearts, and spoons-chosen family, collaboration, surviving post-trauma, and playing smart. Shockingly, most of the truth comes out in a cataclysmic game of "Liar, Liar," erupting in a roast session with impacts potentially larger than any of them realize. Though winning Mallory's lottery means a certain type of liberation, there's little to be done about a neighborhood too far gone. With searing words for the intruding cop academies and the big, bad mayor Rahm himself, there are no minced words, and they come in slam and song."